I couldn't help it, but as I sat in the office of the director of the National Theatre, the incumbent was rapidly metamorphosising into a crawling baby sporting a white yarmulke. 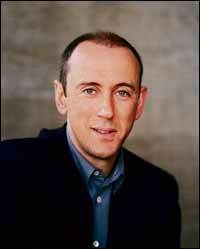 It must have been a first for Sir Nicholas Hytner to be interviewed by his cousin, as it was for me to grill such a close relative. Seeing before me one of the most powerful characters in British theatre, my mind inevitably flashed back to family simchas, sedarim and the short time our education coincided at Manchester Grammar School. His fresh-faced appearance belies his 53 years. His responses at times reminded me of those of a lawyer, measured and with the practised stutter of a QC which buys time before judge and jury before launching into an appropriate reply. The newly knighted Nick is self-effacing. And perish the thought that anyone close to him should accord him his title. "Sir is absolutely off the agenda," he insists, as I joke that the family always believed his father Benet, an octogenarian barrister, would be the first Hytner to achieve a knighthood. To everyone around him at the National he is just plain 'Nick' as he has always been. Why? "In a sentimental way it means I am in the company of those great actor knights and my three predecessors here [at the National Theatre]. "It feels rather rattish and Mr Toadish rather than anything to do with some pompous idea of status. "It doesn't feel like that at all. The theatre knights have always been a pleasantly disreputable crowd. "I would like to think there's a little touch of Sir John Falstaff as well. "I wish I was more Falstaff in some ways. After the third glass of wine I start to get sleepy." I can't believe that Nick would be disreputable but the glint in his eye suggests that theatre life involves letting your hair down at times, as well as your guard. He seems to eat, sleep and dream the theatre which got into his blood at grammar school as he came under the influence of his then English master Brian Phythian, the teacher who ran drama at MGS and got to see his most famous protégé's progress at first hand. Where does he see himself 10 years from now? "Still involved in the theatre in some form or another," Nick is adamant. "I've been here [at the National] seven years. My predecessors have averaged 12. "It's important that someone else comes in and shakes it up again so I won't be here in 10 years, that's for sure. "I would like to think that I won't return simply to directing stuff but that I can continue in some way or other to produce; to be responsible for something more than simply the things I put on the stage myself. "I can't particularly see that there would be some publicly subsidised institution that I would run after this. "I think once you've run this you can't really step sideways into another, but I think I would like to be able to continue to produce as well as direct." "Essentially what I do is produce 20 shows a year here," he confides. "To produce as opposed to direct, as I generate the ideas, generate the repertoire. What I do is put together the team that are going to stage the repertoire together then stand back and come in at a later stage to see how it's all going. "That's different from the job I was doing consistently until I came here, which was just to find for myself a handful of gigs every year and direct them. "I hope I will still have some kind of job that is bigger than simply what I stage myself as a director in 10 years. "I would like to make another film and I'll certainly do another opera, but I'm not a competent film-maker and it's a nightmare world." Self-effacing definitely, for this is the man who has made six films, starting with the Madness of King George (1994), the most recent being the highly acclaimed History Boys (2006). "I think I'm a theatre director who does other stuff," says Nick. "I can't see myself as a film-maker. I love doing opera when ever I've done it, but I always see myself as visiting from the theatre, which is where I belong. "The real film-maker thinks with a camera, which is something I just can't do." Equally, he does not rate himself as much of an actor. This despite acclamation at school and at university, co-scripting and performing in a televised production of the 1977 Cambridge Footlights Revue. "I think I was savvy enough when I went to Cambridge to discover I was a poor actor," insists Nick, although many of his contemporaries may have disagreed. "I had an unspoken desire at least to work in the theatre. "I couldn't act and I couldn't write and I don't think I trust any director who straight off the bat decides he wants to direct - because the job has been invented in the last 100 years." He adds: "I was a show-off at 11. Making the transition from show-off to serious actor requires a lot of concentration - seeing the world through a different pair of eyes. I still wanted to show off at 19 and 20." But there's little doubt that the diversity of skills has embraced every extreme of the stage, from opera, to Shakespeare to such musicals as Miss Saigon and Carousel. Nick's love of the theatre was engendered by early visits to Manchester's Opera House and Palace Theatre with his parents whom he prefers to refer to by their first names of Ben and Joyce. And it was his maternal grandparents Bobby and Vera Myers who used to take him to the Hallé, obviously giving him the string to his bow that led eventually to his lifelong love of classical music and opera which has also touched his professional life. "I remember Olivier very vividly. I was extremely excited to see him because I knew what it meant to see him live and he did very little live on stage after that. "I remember vividly the sheer power of his presence. I do remember that production because he had such extraordinary presence. Jonathan Miller directed it. "It's a horrible play, a sour play. I can't ever imagine doing the play. I don't like the play because it starts undeniably with an antisemitic trait. "Shakespeare, after thinking himself into the Jew's shoes, starts to write unusually sourly about everybody else." Nick is closely associated with The History Boys - but he didn't write a word of it. He related a story to Alan Bennett, which the playwright claims is how indirectly it came about. "I told him that before my voice broke I was a good singer and was much in demand in all the school choirs, including the chamber choir." But Manchester Grammar School's legendary Jewish head of science Sol Clynes was less than impressed. "He denounced me for having sung with the chamber choir a piece I'm pretty sure was something like Benjamin Britten's Rejoice in the Lamb," recalled Nick. "I had no idea what I was singing about. It was sung in the midweek secular assembly. Unfortunately it was sung on the same bill as the Jewish choir. "I was a tremendous musical snob and refused to join the Jewish choir because I thought it was musically not of a high enough standard. "Sol made me stand up in Jewish prayers and denounced me for this act of betrayal. "I was absolutely certain of my grounds, which were musical grounds. "I remember telling Alan this and I don't quite know how he made the leap from that to History Boys. "He then not long after heard me on Michael Berkeley's Radio Three programme choosing music I liked.
" I chose Bewitched Bothered and Bewildered, by Rogers and Hart, sung by Ella Fitzgerald and somehow he made the connection between Jewish kid with unbroken voice singing Bewitched Bothered and Bewildered and he claimed it was from that image that he started to write History Boys. "It was one of the those kind of completely random, instinctive creative acts, putting together two things which are not connected and he's discarding what he doesn't need. "The Jewish kid in class sings Bewitched Bothered and Bewildered. This Jewish kid never sang Bewitched Bothered and Bewildered, because he didn't know who Rogers and Hart were when he was 16. "But that's how that thing started. Northern Grammar School is Alan's school Leeds Modern; the teacher is the teacher Alan wished he'd had. "He'd never had one of those charismatic teachers but he'd heard about them from friends. "It's a weird melange. Alan is remembering his own school days from the 50s and I'm visualising MGS from the 70s." Nick doesn't contemplate retirement, although he knows that he won't remain at the National beyond his sell-by date. He's never considered his epitaph but adds: "It would be great to leave this place in good shape. I don't much think of that. I'd like to keep working. Directors don't last as long as that. You can still go on getting parts when you're 80 but having said that Peter Hall has come back here and he's turning 80. So I'd like to go on as long as Peter. "I'm not sure I've got the patience to act on stage. "If someone cast me in a movie I'd jump at it, a small character role." He mentioned the big scheme over the next three or four years at the National which will transform the building physically. "I think leaving it for whoever runs it next to be able to kick it in another direction would be a great thing but I would like to do it again- but not with another massive public institution like this. "I think the West End is not in a great state and I would love to work there, flex my muscles." He conceded that he couldn't buy a theatre himself but would consider something of a co-operative, perhaps not dissimilarly to what his brother Richard has in mind as one of the Red Knights, the disenchanted fans who are seeking to buy Manchester United from the Glazer family. Nick is irreligious. "I'm not a believer," he admits, "but I do think it is a significant part of my adventure and it fascinates me. "I couldn't say I'm a member of the Jewish community or gay community in that I don't seek out either of those communities to hang out with", (unlike the theatre community of which he is a member). "But it is an important part of who I believe myself to me." Nick quips that as a music-crazy teenager he came to worship "the great symphonic gods, and our minister was Sir John Barbirolli, who was only marginally more charismatic than Rabbi Percy Goldberg at the Jackson's Row shul. "Barbirolli's congregation was, unsurprisingly, very Jewish indeed. "To be honest I found the Sunday concerts more exciting than the Saturday services, and after barmitzvah I dropped shul with ostentatious adolescent certainty." He added: "Maybe tendentiously those of us who are involved in the arts often claim that there is spiritual sustenance enough to be found in them, that we look for God in Mozart and Shakespeare, that we don't need the intervention of religion." Hytner feels an affinity with Israel which he hints replaces his religious affiliation. "I have good friendships and contacts within the Israeli theatre. I've been several times but always because we want to do something together. "But when you go to Tel Aviv and you're hanging out with the Tel Aviv theatre crowd that's Jewish. "And when you wander into the Orthodox areas of Jerusalem you think, I suppose, this is Jewish too. "The energy, curiosity, creativity and entrepreneurialism of Tel Aviv are more profoundly Jewish than the crazies in Jerusalem." Nick introduces a fascinating statistic: Israel has by population by far the highest proportion of theatre visits than any other country, made even more amazing by the fact that "the religious crazies don't go". As National Theatre director Nick is hoping to commission both Habima and a Palestinian group to create shows and to commission a British playwright to create shows "from the point of view of each of our bodies politic about how and why things have reached the path they have reached now". Israeli Arab actors who worked together for years very happily now have tremendous difficulties, Nick laments. "If they live in Ramallah or east Jerusalem it is now nearly impossible to collaborate with Israelis because of pressures put on them by their own communities. "And yet the links between Israeli Arab and Palestinian theatre people remains. "They are full of suspicion but these people have been colleagues for many years." Nick's dream is for parallel Palestinian, Israeli and English plays all looking at the current conflict from different angles but fears "it may quite simply be impossible to get an Israeli and Palestinian company playing side by side. "The Israelis wouldn't have a problem with it". He won't be drawn on the politics of the region, venturing only: "As soon as there is any whiff of admiration for Hamas I'm out of there. "But it's impossible to drive past the West Bank and see the settlements and not feel angry about it. The only thing I can do is find a way for British, Palestinian and Israeli artists to work in the theatre to respond creatively to the tragedy that is unfolding." Nick has never encountered any antisemitism in the theatre. "It's celebrated for minorities. It's a fortunate place to work if you're a member of minorites. It has depended on minorities." He believes the reason for so many Jews always having been involved with the theatre is that it is deep in their DNA. "I think if your central religious texts (the Talmud) are based on a series of dramatic dialogues I can see why that must be somewhere in the DNA. Discussion, debate, creative conflict. That is a play. Maybe there is something in that." He pointed, too, to the remarkable number of great Jewish violinists. To celebrate next year's 400th anniversary of the King James Bible, Nick is planning to recruit a handful of great British actors to give theatrical readings from it. "When I pick up the Bible I just go on reading. It is the most mesmerising language," he said. It seems that for him the theatre is all-consuming, leaving time for little else. "I live a perfectly normal London life. I go to music and I go to dance and I go away. I've just got myself a place in France in Haute Provence." Has he any unfulfilled ambitions? "Are there any operas I've not done that I want to do? Not really, but there are plenty of plays I would love to do.
" I'm much hungrier and I won't be able to do them all while I'm still here. I'm always hungry to do new plays. "What I've really enjoyed here has been changing people's perceptions of what this place is and what a national theatre can be. That's a job that everyone who runs this place can do." If there is one legacy he will have left it is the Travelex £10 scheme which made theatre accessible cheaply to the masses. "It would not be such an issue outside London. but made a huge impact here," insists Nick. "We genuinely transformed not just the audience overnight but our capacity to put on the kind of work that excited because we knew the audience would be there for it. "We've done a great deal of new work and new kinds of work and although there would be some people who would argue that we have done it at the expense of solid productions of the great classics we've not done badly with the great classics either." Nick is guarded about his private life, confiding only that he has a long-term American partner who he sees regularly. He was once described as "too gay and too Jewish for the theatrical establishment" - an epithet he rejects and which he doesn't recall. "I don't know exactly what the theatrical establishment is but it has always included a large gay and a large Jewish contingent," he says. In a career spanning three decades, he says Paul Schofield is the greatest person he has ever directed. "He wanted very, very little conversation. He seemed to work intuitively. The whole thing was absolutely mesmerising." Playing the judge in The Crucible, "what he did was to make fanatical rectitude comprehensible. "He played him from his own point of view and it was powerful to be close to him behind a camera as he seemed to channel a kind of enormity of self-belief that you were almost scared to be in touch with. "All he wanted was quieter, louder, faster, slower. He was the most delightful man to work with and he would at the end of a play just drop it, switch it off and then just switch on this most extraordinarily powerful personification of evil. He was the last of the greats." The names he has enjoyed working with just trip off his tongue: Dames Helen Mirren and Maggie Smith ("an extraordinary experience - she is never good enough for herself"), and the late Nigel Hawthorne ("genuinely great"). And then there was Martin MacDonagh. "I worked with him on an outrageous play. It was wonderful to work with someone who just knew how to do it in his 20s." He mentions with pride all eight of the History Boys who have since made it, including James Corden of Gavin and Stacey fame. He regrets never having worked with Dame Judi Dench-"I'd love to" - and positively refuses to class anyone as the most difficult actor he has encountered. "The great people are never really difficult to work with," Nick avers. "The only ones I ever have a problem with are those who are not secure with what they do." He did mention Harold Pinter, though, who was notoriously hot tempered. You get the impression that Nick is not about to diss the theatre fraternity who seem to have become his extended family. Perhaps by default that makes me a distant relative too of some of the greats.